I swear, I only saw it for the sloths. Yet, by the end of the first two scenes, I had already learned more than enough from Zootopia (2016) to pack up the popcorn, leave the theater, and write this post. I mean, I didn’t. I stayed for the sloths. My point is Zootopia is a highly accessible movie that uses VERY GOOD DEVICE for writing sympathetic characters and fleshing out their motives. Thrice. In the very first scene, we’re introduced to Judy Hopps – a young bunny who wants the impossible: to become a cop in the great big city, Zootopia. Since it’s a Disney movie AND it’s the first scene, we know she’s going to get her wish despite what everyone else tells her. In the second scene, Judy is at some local festival. She hears a sound from behind one of the buildings. Peeking around the corner, she spies these two little helpless lambs begging for the local fox/bully, Gideon Grey, to leave them alone. Judy takes this as a call to action. She steps in, and bravely tries to reason with him Gideon, but the scene quickly devolves into violence. It ends with the huge fox towering over Judy (who now carries claw marks on her face) laughing at her and saying she’ll never be a cop. This encounter with Gideon Grey is the defining moment in Judy’s backstory. What is a Character’s Defining Moment? A defining moment is an important choice a character made in their past – a choice that shaped and defined them in the future. Sometimes, they regret these choices, and they end up hating themselves. For Judy the Bunny-cop, that defining moment of ‘protecting those who cannot protect themselves‘ became her future. But the writer’s at Disney have outdone themselves with this one. Judy’s defining moment is multi-layered. We also expect her to have a special hatred for foxes, because of how cruel Gideon was to her. This allows them to build her character in front of our eyes. They show her meeting Nick Wilde (no relation to Oscar), and the audience expects her to react poorly to him. SHE DOESN’T – she restrains herself, even going out of her way to help the fox. Nick, of course, ends up scamming her, and it all plays out beautifully. See, now the audience has built up this dislike of foxes – in Zootopia, all foxes appear to be evil, conniving bastards. And Nick certainly fits that role, and we blame him for it. That is, until, Nick Wilde’s Defining Moment is revealed. 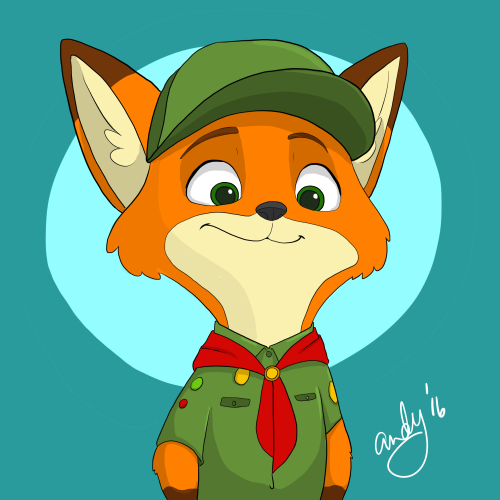 A young fox, barely a kit, squeezes into his cub scout uniform, and looks at himself in the mirror. He’s a bit nervous, yes, but also excited to finally make some new friends. He’s a carnivore, yes, but Zootopia’s society is way beyond those primitive dividing lines, right? It looks like he’s going to fit right in. He’s braving the painful awkwardness of meeting new people and trying to have fun at the meeting – until the adults leave. The young herbivores gang up on him and slap a MUZZLE on the poor little fox’s face. This was probably the most powerful part of the story. The audience no longer perceives herbivores as weak, helpless, or even nice. They can be just as cruel – if not more so – than the meat eaters. The second point sets us up for the solution to the ultimate mystery at the end. The first molds Nick Wilde into a much deeper character – now, we no longer begrudge him for his earlier, underhanded actions. Or, at least, not as much. He becomes a character we can identify with. It’s an unjust situation that begs some harsh rationalization from our fox hero. What we have now is a character with the ability to redeem himself – and help the society that once shunned him. In the end of the movie, the true villain is finally revealed to be the meek, tender-mannered Sheep/Secretary to the Mayor, Bellwether. Bellwether’s defining moment is stretched out over various scenes – each time we see her being abused, neglected, and disrespected by Mayor Lionheart (He calls her “Smellweather!” at one point), we are seeing the fragments that compound into her defining moment. We see, however misguided, her reasons for hating carnivores. When Disney chose to stretch to stretch out her defining moment, they were trying to hide it in plain sight. They couldn’t show the audience that she hated carnivores; that would give it away. Instead, they gave Bellwether the same chance they gave to Judy – both characters are abused by carnivores. Only one character could rise above this abuse, and the subsequent generalized anger that followed. Defining Moments are great for imbuing your characters with realistic morals and motives. They also work fantastically for playing your characters off of each other (Judy + Nick) or juxtaposing the choices your characters make (Judy vs. Bellwether). Note: Dan Brown has a special place in my heart, and I love most of his books. His prose, however, hurt.